RAWHIDE is an European brand with a registered trademark which stands for a high premium quality. RAWHIDE is made of fresh, examined and veterinary approved beef hides only. The production company is part of a large slaughterhouse. The hides are processed directly after the slaughter of the cows. This in contrast with a lot of anonymous chew-products. RAWHIDE is fully digestible. Farm Food Rawhide is solely made of fully digestible hypodermic interstitial tissue. Therefore the dog can easily digest the complete Rawhide with no trouble at all. Although Farm Food Rawhide is fully digestible the nutritional value is almost zero. RAWHIDE is absolutely clean and save. RAWHIDE does not contain any unknown substance. There are no chemical substances (such as chrome, bromine and arsenic) used before, during or after the production of Farm Food Rawhide. Furthermore the decision has been made not to use any colouring to maintain a visual more appealing product. However colouring is known to be harmless, we believe it is wise not to use such unnecessary ingredients, because of the known negative influence of colouring on the behaviour of some children. RAWHIDE does not cause allergic reactions. The above mentioned arguments make sure that allergic or intolerance reactions are unlikely to appear with Farm Food Rawhide. This in contrast to many, anonymous chew-products. It is more and more proven that food allergies are caused by impure, anonymous chew products. Farm Food Rawhide can often been given to dogs that suffer from food-allergies without any problem assuming that it is not a beef allergy. RAWHIDE is a heavy product in his kind. Because of the thickness of the used hides dogs will chew longer on the Farm Food Rawhide. 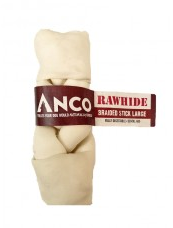 Compared to similar chews, with the same size, Farm Food Rawhide is heavier thanks to the thickness of the skin. Some similar chews are puffed up to make them appear larger. RAWHIDE does not smudge. Dogs can chew on Farm Food Rawhide anywhere, normally without leaving any stains (only if the dog is a very fast chewer, saliva spots can occur). This is because the chews are very clean and without any colouring. Furthermore Farm Food Rawhide will not become sticky. This is an advantage especially for dogs with long hair or a beard.